I'm not sure if people still remember what is today. It's just too quiet for an April Fool day; nobody is playing pranks and I don't hear anyone taking out the mickey of the victims. So what happened?? Of coursela~ Today is Sunday la. Everyone might just sleeping soundly and they don't need renaye to remind them what IS today. So does that mean nobody care anymore about April Fool? Maybe kids rather stick to their playstation these days. Anyone else remembers April Fool?? My April Fool for you guys is I have inserted some advertisements onto my blog. Can you spot them? I'm actually very frustrated for not being able to change my Nutang avatar. I have a 50x50 cm avatars in my laptop and computer and Nutang keeps on reminding me that the avatars I tried to upload were not 50x50 length. Hey is it just because I used a simple Paint program, the blog program is not recognizing my avatar??? And I don't want to see that Jacko representing me. I'm not a Jacko. Why can't I just bloody change the avatar??? Anyway, let's look on the greener area. I was watching Japan Music Station on Animax today and I saw a familiar face. I actually didn't realise who he was and I was just like "Hey that guy is so CUTEEEEEE!!!" because he was wearing glasses and had some small boy hairdo. And then I realised he was the guy in Team Medical Dragon drama ... And then I went "AHHHHHHHHHHHHHH." 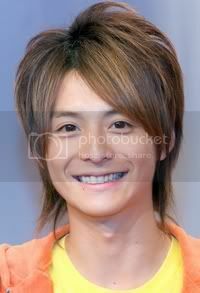 That's because he was very cute in that jdrama as well. Let just say that I called up a long lost friend from Penang a few hours ago to get back something from her. And she was of course extremely not happy to hear my voice because I demanded a compensation in money form. My whole family doesn't really care if our belongings which are 2 racquets belong to my sister and I gone missing forever or not, we just want the compensation. I don't care. And obviously this friend of mine was trying to run away from her responsibility. My mum lent her 2 badminton racquets one year ago and my mother trusted her. But to our horror, she can't be bothered with the racquets and she let someone else to use those racquets. How do we know? Easy, she just said she left the badminton court earlier than the rest and she left the racquets with this irresponsbile youngster. My whole family of course knows who was that and that is why I said irresponsible. Haha .. my mum has even very good relationship with his mum. So they went my racquets. I called her the last week of February to inform her that I will be going to Penang and I hope you could return my racquets. She just said she didn't know who is having them because she was not the last one in the court. Not having the tolerance, I reminded her that my mum gave you her trust and don't betray it. I ended up the call with "I will be looking forward to getting back the rackets." The dateline of her assignment is today. I called her and she text me back that she has called up the person who might be holding the racquets. I kept my feet on the ground firmly and dialled her number immediately. I spat to her that I wanted compensation no matter what. I don't care if the guy found my racket or not. She wasn't happy when she heard that. She said it was not her fault that the racquets were not return to me. Excuse me? I told her indirectly that you have betrayed my mum's trust and my sister and I. What do you think? If you are not responsible, then who is? You were the one who asked for the racquets and we delivered our words but have you? After hearing that, she immediately called up the guy and yes the racquets are with him. She immediately called me back and said "Hey he got the racquets when you want to come and get them" in a very cheerful tone. Amazingly, my feet were still stick to the ground. She was so proud of her tactic of getting the guy to find my belongings by telling him that she needs to pay me RM 1000 for them. I wasn't impressed but disgusted. In my heart, only one sentence was deafening me: WHY ARE YOU RUNNING AWAY FROM YOUR RESPONSIBILITY? You are a mother, a sister, a leader to society members ... and you used this kind of tactic? You just bring shame to our peace loving organization. You break Daisaku Ikeda's heart. There's nothing special about the racquets except they have been with the family for 10 years and they are just RM 50 each. But so what? These racquets were expensive 10 years ago and they can't be bought anywhere now. They are 10 times heavier than the 100 cc badminton racquets. But so what? Treasuring one thing regardless of its significance is the most insignificant personality trait you think but that shows what you are and what people are to you. And I treat my badminton racquets with loving and care by putting them in my cupboard from the rain and shine. I attended one of my managers's farewell party but unfortunately she had it at the wrong place; she had it at a karaoke box. I don't like this kind of place because it's heavily polluted with cigarette smokes and not-enough-of-light. I dislike these kinds of places ... Yesterday, it gave me uneasy feeling because I inhaled too much of smoke because my manager was smoking ... and then the lights were so dimmed ... And then I was having some gastric maybe because I was a little hungry. Oh well, I rushed from 2 appointments to this farewell party so I might have hurt my digestion system. But hey the soup there is not bad and it has a lot of ingredients and taste great. But I was so happy to receive a farewell gift from my manager because the Parker pen was embossed with my name!!!! I also gave her gift which is a scarf. I hope she really likes it and it will be meaningful for her when she's in Singapore. And then I rushed back to watch Heroes, which was worth it ... Peter is NOT DEAD!!!!!!!!!!!!!! The following incident is based on a true event on Monday ... among my workmates and I.
Renaye: So what? Who ask you to be the only guy in the office?? Renaye: Aiyo B !!!!!!!!!!!! How can you be so cruel to the only guy in the office?? Even I'm so cruel to him ... I won't even asked A to pergi mati!!! (go and die) You are so cruel, B !!!!!!!!!! Everyone in the office laughed ... You see I have a wonderdul selective hearing right? *Kids are not permitted to imitate these scenes. Copyrighted Renaye. I had a seminar meeting today by one of the office sempai and apparently the manager and everyone in the office want me to be the emcee for every seminar we host. Oh what a big deal. I like talking and a dumb idiot joker but I don't like hosting. And being a talkative person doesn't mean I'm natural born speaker. No I don't. I'm not like Ellen DeGeneres who can host the Oscar award so well and she has talent in hosting her own show. I'm not saying I'm just underestimating myself but it's not something I want and like to do. I know the upcoming seminar is a very grand one because a nobel peace laureate nominee might be coming to our seminar as a keynote speaker. Yes, I know, it's once of the lifetime to be a host to such an honour guest. Even my tarot card reading said whatever opportunity I have, I should have just grab. But ... is that something I really want to do? I like being low profile. I don't mind being an usher for the seminar as long don't make me do things I don't really like to do. I suggested to have a responsibility rotation. This will give me a fair chance to everyone to taste everything even your English is not that superb.